In a few weeks, Oscar nominations will be announced, and it looks like indie films are up for another triumphant year. However, only one film has made an appearance in six pre-Oscar award-giving bodies (which include the Screen Actors Guild and Golden Globes)--Kathryn Bigelow's war thriller The Hurt Locker, produced by Summit Entertainment (yup, the same group that released Twilight and New Moon). 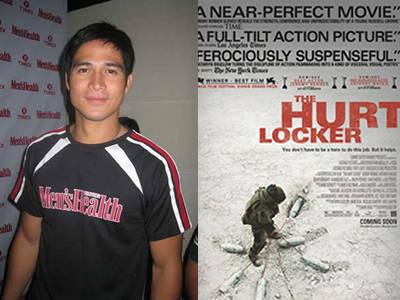 We hope they'll show The Hurt Locker here in the Philippines. Could this also mean that the radical and next-to-unknown Kathryn Bigelow has a good chance of becoming the first female filmmaker to take home a Best Director Oscar? Let's cross our fingers that girl power will finally prevail in the Oscars. Meanwhile, The Hurt Locker is up against Quentin Tarantino's masterpiece, Inglorious Basterds, and the Oprah Winfrey-produced Precious in the Best Picture category of the Producers Guild of America awards. Check the complete list of nominees here. Still not over: The "over-stretched" Krista-Manny-and-Jinkee-Pacquiao controversy continues. Even Krista Ranillo's refusal to break her silence is now an issue, with her manager Arnold Vegafria taking care of denying rumors that the young actress is pregnant. CNN Hero of the Year Efren Penaflorida confirmed that he is indeed courting Emmy Award-nominated actress Angel Locsin, who has said that she just wants them to be friends for now. But Angel, however, also shared to Spot.ph: "'Yung mga cause na ginagawa niya, sinusuportahan ko. Naniniwala ako sa mga gusto niyang gawin." Jackie Rice greets 2010 with a big bang, as she graces the cover of FHM Philippines' January issue. FHM has a Starstruck alumni on its cover for the third month in a row: Jennylyn Mercado (female winner of Batch 1) in November 2009, LJ Reyes (female runner-up of Batch 2) in December 2009, and now, Jackie (female winner of Batch 3). We wonder who's next--will it be someone from Batch 4? So, your honey's waistline seems to have grown a few inches after the holidays; how do you help him get back in shape in time for your Valentine beach escapade? Get him the January 2010 issue of Men's Health Philippines for two reasons: one, so he can get some tips on how to shed that extra fat faster; and two, for yourself--as it features the ultimate hunk Piolo Pascual (with his gorgeous abs bared) on the cover. Watch for Cosmo's interview with Piolo next week!